What child isn’t fascinated with germs? Today we talked about the lymphatic system- more specifically how our body gets rid of those germy bugs! Disclaimer: I am not in the medical field and I hope what I am teaching my daughter is somewhat accurate!! Ha! We looked at the lymph nodes in our human body encyclopedia (my daughter refers to the nodes as “beans”, which makes sense because they are so small!). We talked about white blood cells: how they are the guys that fight the germies and that some of these cells are stored in the lymph nodes. I then had a visual to show my daughter why lymph nodes get swollen. We inserted white blood cells (aka cotton balls) into the lymph node (aka balloon). The more white blood cells, the bigger the balloon got! We then pulled out our body chart. Lymph nodes were added using green thumbprints- and although they are found throughout the entire body, we just stuck them in a few spots. We couldn’t forget to add white blood cells- little dots of white paint with a q-tip. Boo decided it was time for a break…..
Then it was back to work taping on the lymph vessels using green embroidery floss. The last thing we added was the spleen. We talked about how one of the jobs of the spleen (referred to as the “big bean”) is to store extra white blood cells. We might go back tomorrow and actually paint some cells on the spleen! Boo and I played a quick game of Germ Attack… germs entered various parts of the body and the white blood cells (cotton balls) raced along the lymph vessel to attack the germs! We tried watching the Once Upon a Time video on the lymphatic system– but we only got through the first part (it’s a three part series). This would be much more entertaining for an older child! 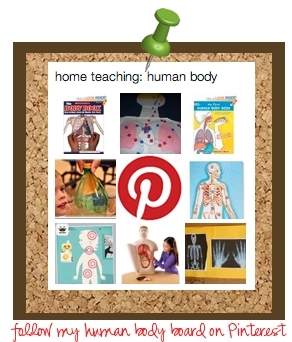 This entry was posted in explorations, human body, learningtime, montessori, science and tagged lymphatic system, skeleton on January 13, 2012 by ktoponce. I’m loving these ideas, thanks for sharing them!